Recorded as part of Performance Art Week Aotearoa late 2017 at Te Aro Park, Wellington, original site of Te Aro Pa and a public artwork by Shona Rapira Davies, Aucland performance artist Robyn Jordaan and Joel Baxendale of Binge Culture Collective briefly discuss the strengths and politics of working in public space. 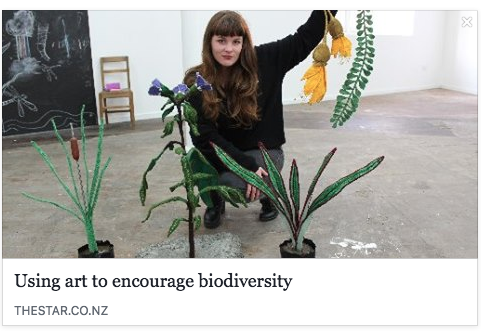 Jordaan was in Wellington to perform at Performance Art Week in Island Bay Park, while Binge Culture had returned to Wellington from Edinburgh with their park-based participatory work Ancient Shrines and Half-Truths. Binge Culture Collective’s next production is with Barbarian Productions It’s a Trial in Auckland on 22 February 2018. Our apologies for some Wellington public space wind and traffic noise. The conversation was part of Urban Dreams a monthly conversation series, organised by Urban Dream Brokerage creating conversation and networking around arts across disciplines working in new spaces. Image: Robyn Jordaan, by Gabrielle McKone. A library of pocasts of the initial discussions in the series can be found here.